When picking out the perfect engagement ring, you want it to be unique and special just like your relationship with your partner. A great way to make an engagement ring more personalized is to follow the growing color gemstone engagement ring trend. Bold color gemstone engagement rings are all the rage this season. Millennials love options and have begun to consider these meaningful center gems as an alternative to traditional diamonds. So, how can you use color gemstones to pick out an engagement ring for your loved one? Below are three ways to incorporate gemstones for the ultimate proposal. Similar to your astrological sign, your birthstone can say a lot about you. The month of your birth can have an impact on your personality, temperament, and different qualities that you exhibit every day. Many people are proud of their birthstone and what it says about them, so it’s very important to understand the meaning behind the stone before you place it into a piece of jewelry. In honor of the month of July, here’s a little history about the ruby: it represents undying, passionate love – making it a great stone for an engagement ring. During the 18th century, rubies that were paired with diamonds were the ultimate symbol for eternity and have been viewed as the gem of passion and courage. 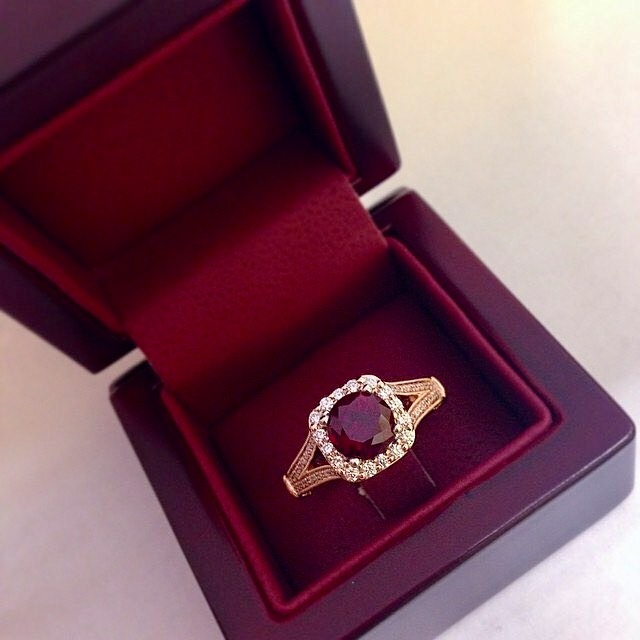 Regardless if you’re shopping for a ruby or another centerpiece stone, knowing the meaning and history behind the gem makes the ring as unique and special as the love you share with your partner. Nowadays, the options are endless for pairing gemstones with the right type of ring. Different band designs can carry different meanings, as you can choose between modern, classic, elaborate, or even vintage. Typically, those going for a more simple design will pick the classic solitaire design — this simple, elegant and timeless design has been the archetypical engagement ring since the 1800s. 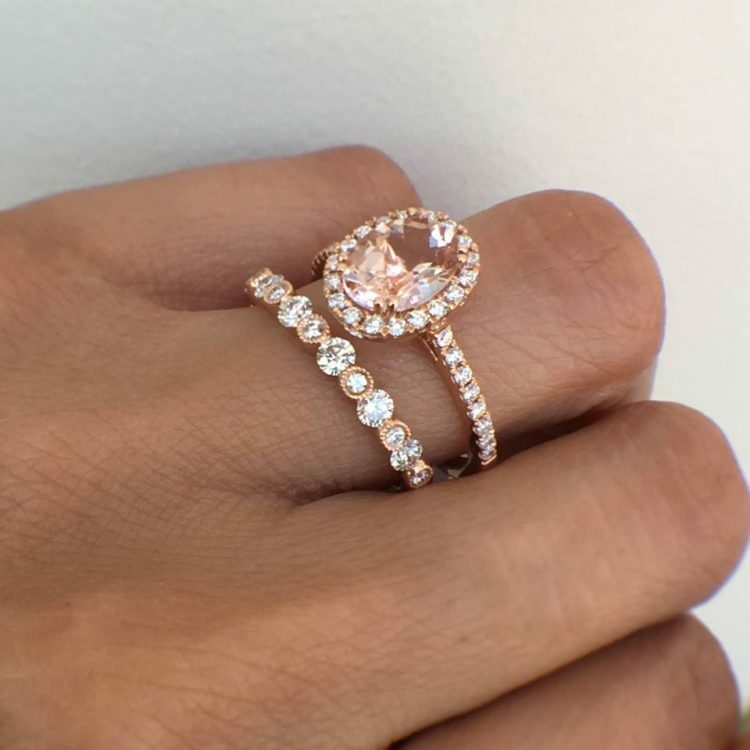 Designs that have been trending amongst millennials include the halo and stackables, in which you can easily incorporate color gemstones to give it that unique, one-of-a-kind look. Now that you’ve picked out the perfect engagement ring for your partner, it’s important to keep in mind that he or she will probably wear other jewelry along with it. Jewelry allows us to express our individuality, so keeping full sets in mind is always a good idea. Because color gemstones are trendy and personalized, it makes it easy to add them into necklaces, bracelets, and earrings for everyday wear. Additionally, color gemstone jewelry is a great gift to give outside of the engagement. Giving a piece of jewelry that incorporates a sentimental gemstone for a birthday, anniversary, or special holiday is a great way to show your parents, grandparents, spouse, close friends, etc. how special they really are. Although diamonds are the classic American symbol of love and engagement, birthstones and color gemstones have the ability to make your proposal more personalized and unique. With each birthstone having its own history and meaning, adding this sentimental feature will make picking out the ring even more special. Robbins Brothers, The Engagement Ring Store specializes in proprietary and designer engagement ring settings and loose diamonds. The company also carries an extensive selection of wedding bands, promise rings, anniversary bands, three-stone and stackable rings, earrings, necklaces and bracelets. To learn more about Robbins Brothers, please visit www.robbinsbrothers.com.